At a May 17 New York City gala dinner, the Cato Institute awarded its $250,000 Milton Friedman Prize for Advancing Liberty to Cuba’s Ladies in White. This award, the political reaction to the award, Cato’s other positions on Cuba and Cato’s background raise interesting issues as discussed below. The keynote speaker at the gala dinner was Brazilian Judge, Sergio Moro, who become a household name in his country thanks to Operation Car Wash, the massive scandal in which he has sent some of Brazil’s most powerful politicians and business elite to jail for corruption. Just before Cato’s dinner, U.S. 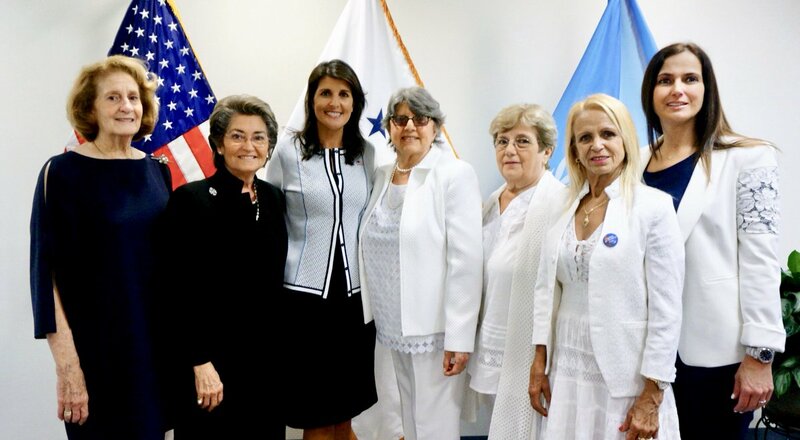 Ambassador Nikki Haley met with representatives of Cuba’s Ladies in White at the U.N. and with a photo tweeted, “Congratulations to the Ladies in White for your Milton Friedman award for advancing liberty. The US stands behind you in your fight against the Cuban government for the rights of its people.” Here is that photo of Ambassador Haley with members of the group. On Sunday, May 20, the Ladies in White who were on the street were arrested and soon thereafter released except for Marieta Martinez. And the next Tuesday, May 22, their leader, Berta Soler, was arrested outside the group’s Havana headquarters. Another member, Cecilia Guerra, was also arrested outside the headquarters and immediately released. In addition, two others, Maria Carolina Labrada and Deysi Artiless, were arrested at their homes. Fred Young, Former Owner, Young Radiator Company, and major supporter of conservative groups and candidates. The members of the International Selection Committee for the 2018 Prize were Leszek Balcerowicz, Former Deputy Prime Minister and Finance Minister, Poland; Janice Rogers Brown, Former Judge, U.S. Court of Appeals for the District of Columbia Circuit; Vicente Fox. Former President, Mexico; Sloane Frost, Chairwoman, Board of Directors, Students for Liberty; Peter N. Goettler, President and CEO, Cato Institute; Herman Mashaba. Executive Mayor, Johannesburg, South Africa; Harvey Silverglate, Co-founder, Foundation for Individual Rights in Education; Donald G. Smith, President, Donald Smith & Company Inc.; and Linda Whetstone, Chair, Atlas Network. The preceding account of the history of the Ladies in White tells an impressive story of alleged Cuban suppression of dissent, free speech and assembly and freedom of religion. The Cuban government, however, disagrees and is believed to assert that these women are not religious activists and dissenters, but trouble-makers for hire by the CIA or U.S. Agency for International Development or private groups in the U.S. Which account is true? We need to hear more from the Cubans and U.S. journalists or private investigators who have investigated the activities of the Ladies in White. The creation of the Cato Institute (f/k/a Charles Koch Foundation) by Charles Koch and the changing of its name perhaps to conceal or minimize its Koch origins raise questions about its objectivity and fairness. Cato’s 19-member Board has 17 white, very successful and wealthy men and two white women who apparently are married to very successful and wealthy white men. This too raises questions about the board’s objectivity and fairness. Cato Institute, The Milton Friedman Prize for Advancing Liberty: Las Damas de Blanco, Winner of the 2018 Milton Friedman Prize; Whitefield, Cuba’s Ladies in White win $250,000 prize for advancing liberty, Miami Herald (May 17, 2018). U.S. Miss. to UN, Tweet: Congratulations to the Ladies in White (May 17, 2018); Press Release, Rubio, Menendez, Nelson, Cruz Introduce Resolution Honoring ladies in White for Milton Friedman Prize for Advancing Liberty (May 16, 2018). The regime stops Berta Soler and deploys operations in the homes of other Ladies in White, Diario de Cuba (May 22, 2018). Cato Institute, CATO Handbook for Policymakers—Relations with Cuba, 8th Edition (2017); Bandow, Trump Panders on Cuba, Preferring Cold War over Progress, Cato Inst. (June 23, 2017). Cato Institute, About Cato; Cato Institute, Wikipedia.